The drama Children of a Lesser God has wrapped. The last episode already aired today! 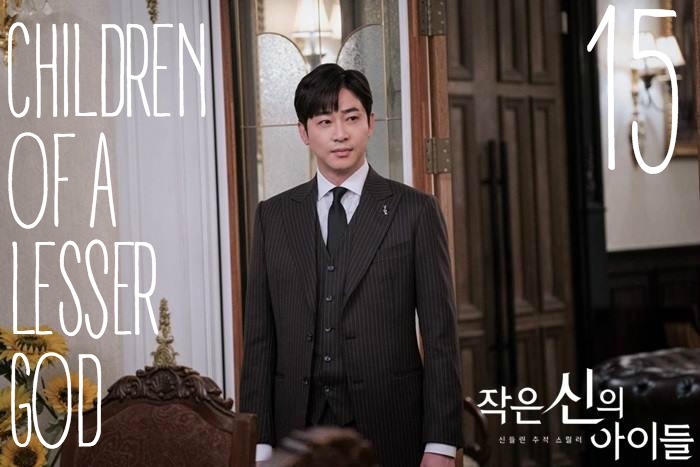 We are still catching up on our drama’s so we are going to watch and post this drama’s recaps next because it is one of our favorites and it is the finale weekend. The last episode post is coming up! KD walks to a wall and looks at the candidate posters. Kuk Han-joo is the #1 candidate. She walks off. HM sits in a cafe and broods as he plays with something on the table. He leaves the cade and leaves what he was playing with on the table…the bracelet he gave Kim Dan. Cut to JI playing an upbeat song on the piano. But this is a press conference? JI finishes playing and addresses all the press. He says that song is a hymnal that ChungIn church made. The big church scandal is about ChungIn church. they found out that a lot of money was laundered. They have their book of revelations which is their accounting book. We found it at ChungIn church. From now on we are going to have a tax search and ChungIn church. It is half a billion dollars, where did they use that money? We think they used it for lobbying, especially for the presidential race. HJ tells his secretary that we don’t have to watch it anymore. It took him over twenty years to build and only twenty something seconds to come down. News: The person who received this money is watching this press conference, we will report it at the next press conference. Once we get the evidence, we will report it. HJ wonders what JI is trying to do. HM thinks, if it is me then I am just breaking the news first, what are you thinking Chun Jae-in? Korean IRS goes to ChungIn church and seizes all their tax information. KD says that they will do one thing and JI will do something else so the focus will be all on one side so JI can do everything secretly behind the scenes. They will pretend like they will attack the East but will actually attack the West. KD hits DH in the head and laughs as she apologizes. JI calls all the people who received money, to a meeting. He reads all the money that they received. Everyone tries to deny it. JI says that their sentence will be different if it is for a favor. All the elite people are there so listen to me carefully, so long as I have this is my hands, you will not be forgiven when we have a new administration. You will either die with Kuk Han-ju or you can take my one chance. HJ says he can’t contact the elders, JI is working faster than them. HM says that they should turn the car around, he will take care of them both, JI and KD. In the elders meeting, all the elders write the confession letters. KD calls JI, he should come, hurry! Kuk Han-ju apologizes at a press conference he says that he wants to say sorry. The Chun Jae-in scandal name is not released yet, but I am on it also. the press ask him if he got illegal money. HJ says he doesn’t know the details of where the money is from, but as a politician, he didn’t realize that the money was illegal and used it. (flashback of HM telling him to apologize and accept everything from the press, HM will take care of everything). HJ holds letters from the people that support him. He says that i the hope and the reason why he went into politics. That is why he is more embarrassed. KD and JI watch this. HJ says that he is going to resi—— But the crowd murmurs and a lot of people say that he shouldn’t. Someone comes on stage and says that HJ helped him, he was about to be bankrupt, he gave me money and payed it off after I sent him this letter, I took that money, he should stay in this race. Another woman comes up and says the same thing, he payed for her daughters treatment, he didn’t’ receive it, I received it, he is innocent. JI says that he is selling emotions. Let’s go. The bone forensics doctor comes out. Heavens Door was a murder case. The autopsy report may have been fabricated before. The same prosecutor to take care of heaven’s Door was Kuk Han-joo. HJ and Pastor Wang have known each other since Heavens Door. HJ throws something. He released Heavens Door! Finally! Where is HM! HM shows up. KD is there as well. She wants to interview him. She asks him how long he will do this. He tells her that he wants her to be hurt also. He goes inside the press room. JI says that HJ hid 31 peoples murder he will give the reason later. HM tells him that he needs to give the reason now, his father was a police officer right? HM hands JI a file. JI looks at the file and looks shocked. He tells him not to play around. But HM says that they have a witness. A man walks in who gave the autopsy. He says that 24 years ago, he found that the neck was broken, it was evidence of murder. Someone told him to hide the truth and threatened his family. Who did that? KHJ? No, it was JI’s appa. He wanted to hide the truth. JI says, that is a lie! HM holds up the evidence that JI’s appa fabricated. This is HM’s theory because JI doesn’t stop blaming HJ for Heavens Door. He wants to keep his fathers honor. JI calls him an a-hole, he will kill him! Afterwards, HM sits with HJ, HJ asks him how he thought of that. HM mentions that guests become the owner and take control of the situation (Chinese book). HJ says that he is very good. But the female detective…..she has a strange power, you like her? He says that he used to. HJ wants to know why it is past tense now? Is it still going on? HM says if that was so then he wouldn’t be there at all right now. HJ wants to know why it is HJ and not her. HM says it is because he knows that they will not win over HJ. HJ tells HM to follow him to the end, he is like his son. If you betray me then I will kill you and that woman. The Blue House in front of us, what do you want to be? HM says his dream is that he wants to be a grocery store owner. The crooked cop says that JI’s father should return his medal of honor if it is true. JI says that this crooked cop should return his as well, I know you work for Kuk Han-ju. JI meets with his father figure and asks him what happened. The father and he showed up at the scene and say that they saw something. A bruise mark. The father figure thinks this isa big case, they might be promoted two ranks. But appa thinks something is strange, the neck is broken on this body. There are 31 wills. Appa says that there are 30 dead bodies but there are 31 wills. The numbers don’t match. So someone got away, they might have a survivor, not just a survivor. He found the murder evidence, until they do a thorough investigation, he shouldn’t release it as a suicide. He is talking to HJ. HJ asks his name and says that he is a good cop. The friend says that HJ kept his eye on his father since then. He went to HJ’s golf club and went to Seoul with a promise for a promotion. So it looks like it is true. His father didn’t’ release it. JI is chocked up, he is about to cry and can’t talk. He walks the streets later and talks to KD, but she is busy. JI says he doesn’t want to be alone today., but they had already hung up. JI gets home, everyone is eating jajangmyun at his house. JI tells him that he doesn’t want comforting, it is not his style to get damaged by those things. He starts crying. Someone asks him if he is crying but he says it is allergies. KD tells him to trust his father since they are family. He says thank you, but he also says that he is not confident. DH asks him how he died. JI says a truck hit him. He has the newspaper article. They start to talk about a lot of people who died related to that heaven’s Door case. His father was the first person who went to Heavens Door. They all happened 3-4 months after the case. It is not a coincidence. If his father was on HJ’s side, then he wouldn’t have been killed. They fabricated the report. Your sisters death also. Are you okay? JI says he will fire back at them with this information. News: HJ goes to the Heaven’s Door peoples tomb. News camera’s are there to catch all of this. The police watch this on the news, but crooked cop tells them to work. They will guard he candidate. Meanwhile Pastor Wang prays deeply about removing all the sins and all the devils. He tells the Lord thank you, thank you. I will clean all the unbelievers with blood. Thank you father, thank you. The police go to guard a candidate and wonder if he would be a good president. they think he will be better than HJ. But then a lot of protesters come in and yell at this candidate about a firing. But all the protesters appear red to KD. They have blood all over them KD thinks they are all going to die. Pastor Wang and HJ meet. DG gave the book to JI so they should kill him. HJ wonders if they will win, they are 4 points behind. Their plan should be for a little rat to destroy a big dam, so their plan should be perfect. Gods soldiers are moving now. Outside, all the protesters say that they did a good job, lets go. KD watches them. She touches one of the woman and sees a vision of all of the people about to jump off of a rooftop. VO – These people jump off of the building, that is why they are red. She asks them if they go to ChunIn church. Don’t they go there or know the Pastor? they says that they are poor people. KD wonders to herself why they will jump off of the building. The people tell her not to pick the #2 candidate. Elsewhere, JI sits with crooked cop (CC). They talk about their parents. Ji says that CC has an old mother that is proud of him and a wife he married two years ago. two years ago the serial killers blood changed. What do you think will happen if people know that a police officer is behind that case? You family members will be disappointed. CC yells, who said that! Who said that! Do you have any evidence? JI asks him, DO I catch anyone without evidence? Lets go to our homepage at 9pm. Don’t forget to say goodbye to your family members. Remember when we graduated from police school and went to our first location, that food we ate together was really good. JI leaves. CC calls someone but they aren’t receiving his phone call. JI wonders why no one is receiving the phone call. DH wonders where he got the wire tapper from. JI says he borrowed it from CC. Someone picks up the phone for CC and CC basically incriminates himself on the phone. He says he didn’t know that that killer would kill JI’s sister. You involved me in this! It is the fathers friend he is talking to! JI hears this voice, he knows who it is. The fathers friend tells CC not to be fished. KD is still with the protesters. She sees one of the protesters with her mother. The mother is feeding the kid. JI meets with father figure over chicken. He asks him if he remembers it, he was more like a father than his own father. Father Figure asks him if something happened to him. JI says that FF told him that your honor is more important than your own life. After you became a police officer, have you ever betrayed the police honor? FF says, never. JI tells him that he will tell him about someone he knows. 24 years ago, a policeman put his best friend to death. To release his guilty feeling, he took care of his friends kids. Then finally, to hide his sin, he did the same thing to the kid. Flashback. Sister asks FF about Heaven’s Door case. She wants to be connected with those people. She doesn’t’ think it is a suicide case, she wants to make it a featured article. He tells her to tell her brother, but she says he is busy with the serial killer case. FF says he will see what he can do. They laugh as she leaves and talk about buying chicken for each other. But his face falls after the door closes. He calls the candidate and says that a reporter is investigating Heaven’s Door case, it is Chun Su-in. FF tells JI that he doesn’t know who the policeman is, but he told him all the time that Police always have to have evidence. JI says, please….please…tell me you are sorry. FF says he didn’t’ do anything to feel sorry to him about. A tear falls from JI’s face. FF says, if you have something to protect, people can do anything. JI agrees, he is the same. He calls someone and tells them to release it now. DH is on the other end of the phone and says, “Yes sir.” He releases the recording of CC and FF. CC hears this and finds the bug on him. DH and SG walk in on him and tell him, let’s go. CC fights them off and runs. FF listens to it at the cafe and laughs. meanwhile, JI is at the police station and gives CC the cuffs. He says this is his lat consideration. CC says he was always an a-hole at school and now. they start to fight and exchange punch after punch. JI drops him, HJ ad DH come up and put on the handcuffs. DG calls his daughter to see if she is fine. Then he tells her to do whatever they ask her and prepare to get married, he will take care of everything. Ask JI to visit him. JI and KD meet and talk about how all the people will jump off of the building. This has no connection with ChunIn church. They don’t know they motive. JI says these people were fired because of the #2 candidate. They need to stop this, it will happen before the election. KD wants to stop it. JI tells her that he trusts her and she needs to trust herself. If they can’t stop it, it is not her fault. KD says she will trust it. She puts her hand on the picture. Images flood into her mind and a word: rhythm. JI says that he found it, it is a game company. KD thinks they should check it. JI gets a phone from AH, her father wants to met with him. The chairman will testify against the Pastor and HJ. He will testify everything that they know. KD tell shim to go there and she will go to the game company. Across town AH gets fitted for her wedding dress. Her mother think she looks like an angel. The husband to be will be so happy. But Ah says that he might not come since this is an arranged marriage. Umma wants appa to come back before the marriage. Someone tries to kill the chairman in jail. He is being strangled until he passes out. Perhaps he is dead. Umma gets a call and yells, who died! Why is he dead! Why! AH wants to know what just happened. Umma tells AH that her appa was just killed int he jail AH breaks down and starts screaming. JI confirms that DG was killed. KD gets a call and is filled in by JI. He thinks it was by HJ. KD tells him that she hasn’t found the building yet. They don’t have enough time, she has to go somewhere. HM sits at home and watches the video where he played soccer with KD, JI, and the kids. Someone rings his bell. It is KD. He wants to know why she is there. She says it is because she wanted to see him. Not Joo Ha-min, but Popeye. HM says that he should know about it if HJ planned it. KD says that it will happen tonight or tomorrow night, it is her intuition. He wants to know what that means. She tells him to hold some nuts. She guesses whether it is an even number or an odd number. This is the game that they played before. KD speaks to him in banmal like a friend and asks if he trusts her now. The pastor meets with HJ and says that Heaven’s Door opens again after 24 years. KD wants HM to help her, he can find out. He doesn’t think she can stop them. He wants to know if she is confident that she will see what they saw before (the mass murder). He thinks back to that and holds his head. She tells him that they should go together. She extends her hand and he looks up at her. KD – if you stay here, you will die, used like Apollo or Yoon-ah. Let’s go together. He slowly is about to take her hand, but it is difficult for him, he puts his hand down and says that he can’t. He has too much blood on his hands already. He can’t take it back anymore. KD tears up but tries to compose herself. She leaves and he cries as he watches her leave. KD leaves the building and HM follows her. But she doesn’t know he is following her. AH looks at them both. She calls HM. HM looks at the phone for a long moment and takes a deep breath. it goes to voicemail. AH is angry, she revs her engine and hits HM. He falls on the ground. KD sees this as a vision. She turns back and sees that it is about to happen. She pushes him out of the way. She is hit by the car instead, as she flies throughout he air she sees the sign on the building upside down, it is Dinosaur. It is a dinosaur exhibition. AH drives off. HM goes up to KD and calls 911, he asks her why she did that. But KD pulls 911 (119) and says not to call. She has to go, I have to go. JI gets to the building that has the dinosaur exhibition. KD also stumbles to the building. All the people are on top of the building. JI is also there dressed like the protesters and standing right at the edge of the building as if he will jump as well.